One of the most picturesque and recognizable plazas, an emblem of the popular Baroque of the 17th century. Designed to complete a double function, the purely urban as the town’s center of life, and that of the bull ring. One of its three gates was, additionally, a bullpen alley. In 1624 they celebrated the bullfighting festivals that Philip IV and Quevedo attended, the moment that many historians consider that the Main Square was inaugurated such as we see it nowadays. 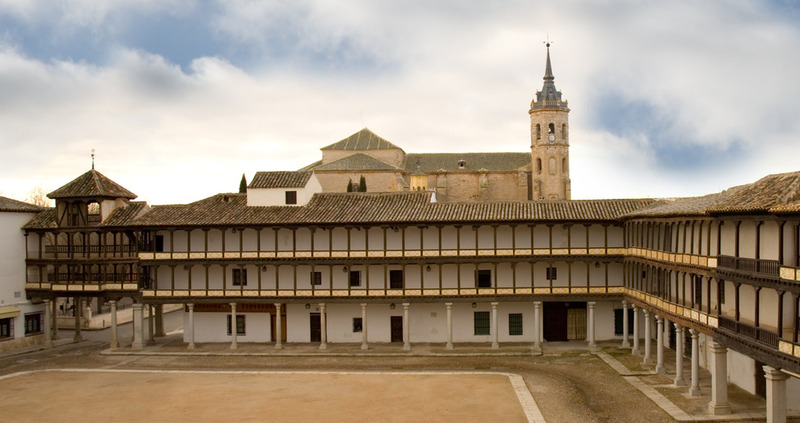 It is clear that the intention was to create a homogenous plaza that would allow people to attend the bull spectacles comfortably, in such a way that in place of the usual independent balconies, they joined two levels of passageways in front of the facades of the buildings. The lower level is a corridor of porticoes, in the style of the ancient ecclesiastical cloisters. It is supported by Tuscan order columns, the shaft is smooth granite, upon which simple wooden footings are mounted. In the entries, the columns are complimented with quadrangular sectioned pillars. This first body is covered by beamed vaults or inlaid bricks. The upper hallways make it possible to go all around the perimeter of the plaza thanks to bridges over the streets, avoiding in this way the complex and expensive set up of rows, as so happened in the plazas that were not closed. These two upper levels are supported by wooden pillars, whitewashed facades and the ledges decorated with the cross of Saint John. The turret also stands out, which for celebrations was used as the box suite for the authorities. The main entry to the plaza is covered by an overhang with a gabled roof. The majority of the original pillars and columns were replaced at the end of the 20th century with new ones. On one of the sides is the City Hall, built in 1654. It was declared a Monument in 1973. The last bullfighting event took place in 1987.